TRANSFER is pleased to present in our fourth Moving Image Art Fair, exhibiting an installation straight from Jamie Zigelbaum’s solo show ‘NO THERE THERE’ an exhibition of new work that explores the materiality of the digital image. Zigelbaum’s new web-based installation piece ’100 Hours Per Minute’ invites fair patrons to search YouTube’s video library (which is estimated to grow 100 hours per minute) via tweets to @100_HPM using a unique hashtag generated inside the gallery. Each tweet programmatically creates an abstract ‘average’ of returned videos – the resulting moving image is queued and played on his large-format display in the fair and simultaneously uploaded back to YouTube for the world to view. 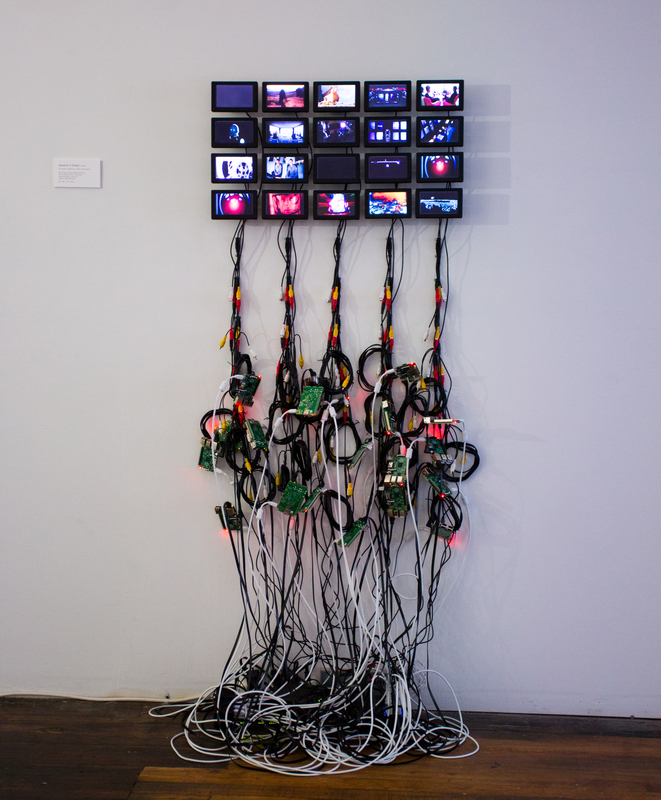 Jamie Zigelbaum, ‘Sequence in Parallel’ 2015, LCD Displays, Raspberry Pi’s, Software, Cabling, Hardware. Unique. In Zigelbaum’s ‘Sequence in Parallel‘ twenty small LCD screens flicker in a grid, running on a network of Raspberry Pi’s dangling, exposed below. The grid display of ‘Sequence in Parallel’ screens a selection of Zigelbaum’s favorite films, spliced into 1/20th segments. All twenty loops play simultaneously across the screens, allowing a viewer to glimpse the entire film object as a whole. All three pieces comes directly to the fair from a solo exhibition at TRANSFER – Jamie Zigelbaum’s ‘NO THERE THERE’ is the artist’s first solo exhibition with the gallery and his first solo presentation in the USA. ‘NO THERE THERE’ is an exhibition of new work that explores the materiality of the digital image. This exhibition begins with two of the artist’s earlier works ‘Pixel’ and ‘Six-Forty by Four-Eighty’ but moves beyond Zigelbaum’s interest in the “recontextualization of the pixel” to question the role of the screen itself — moving images are programmatically constructed and displayed in unconventional formats, hardware is sliced and exposed, and interactive artworks engage the viewer in reconsidering the false dichotomy of the natural and the digital.